This is a rectangular flange Eveready Ignition Batteries porcelain sign. This particular Eveready Ignition Batteries sign is predominantly white with maroon and black text. 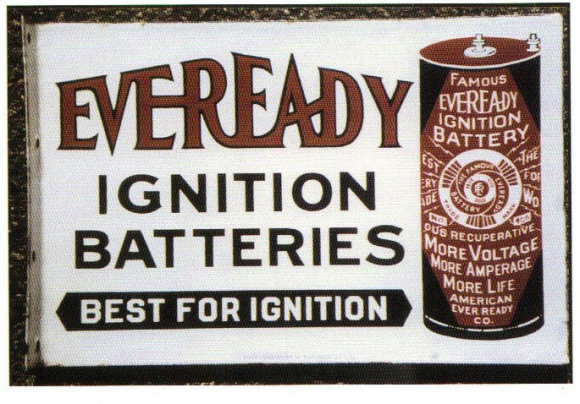 It reads, “Eveready Ignition Batteries, Best for Ignition, Famous Eveready Ignition Battery, More Voltage, More Amperage, More Life, American Ever Ready Co.” and features a maroon and black Eveready battery along the right side of the sign.